First the question arises: who is Śrī Rāma? When we say 'RAma' (Śrī Rāma), then it means we are talking about the most perfect incarnation of God or God himself in human form as a Young prince of Ayodhya or the Supreme personality of godhead. Madhvacharya says — "Ram literally means the supreme bliss, Ram means the 'Brahman' (the absolute, the supreme element) as well as Ishwara (the god with form) Both". In simple words Ram is the supreme cosmic spirit, all pervading, the embodiment of all souls and thus the ultimate consciousness. And as Ishwara (the qualified Brahman with infinite attributes i.e. Śrī Rāma with form), he is mine of infinite auspicious qualities, the original source of supreme bliss, the original cause of all the causes, the supreme refuge of all Jivas (individual souls) and hence the subject of worship for all Jivas. Since Ishwara is subject of worship for all Jivas, to be loved most, so Ram as the prince of Ayodhya, the supreme personality unto whom one should take refuge should be main focus. In whole world people know about Lord Rama, the prince of Ayodhya (a place in India) and his saga 'Ramayana'. Shri Rama is on the lips of every man, woman, child in the sacred land of Bharatvarsha (India), not only because he is god himself but most prominently as an ideal hero, the role model for everyone in true sense and hence he is popularly known as Maryada Purushottama (the best among men). Lord Rama is the supreme Purusa, the Supreme personality of godhead eulogized by all Vedic-scriptures in one voice. In words of Vedavatar Shrimad Valmiki Ramayana — Shri Ram is the sun of sun (Maha-Surya), the fire of fire, the god of god, the supreme unchanging element, perfect, omniscient, omnipresent, incorporeal, supremely independent, the ruler of even those who govern all, Prabhoh-Prabhu, the eternal Maha-VishNu, the supreme Paratpar Brahman. So everything exists in Ram and Ram pervades everything. He is Ishwara as well as Brahman itself. Ram means Brahman, Ram means Ishwara. Lord Rāma is known as Purushottama which means the best of men or the Supreme Purusa (personality). Śrī Rāma, the perfect Avatar (incarnation) of the Supreme omnipresent God, is an all-time favorite among Hindu deities. The most popular symbol of chivalry and virtue, Śrī Rāma - in the words of Swami Vivekananda - is "the embodiment of truth, of morality, the ideal son, the ideal husband, and above all, the ideal king." "Shri Rama is the embodiment of righteousness, he is sadhu (noble, equable person) with truthfulness as his valour and as Indra to all gods, he (Lord Rama) is the king of the entire world. Anyone can find the tale of Śrī Rāma and his life in Ramayana, which is known as the first epic poem in whole world, written by sage Valmiki. With a moon-like face, Śrī Rāma is an extreme delight to look at. By His form (रूप), qualities (गुणैः) and generosity He steals the vision and hearts of even men! What about women? What a futile question!!! Be it Naam (name, नाम) or form (रूपं), or Leela (exploits or pastimes, लीला ) or Abode (धाम) of Lord Rama, it is higher than the highest (ParatPar, परात्परम् ). All divine transcendental qualities are found to the full extent in Śrī Rāma and those all divine qualities collectively can't be found to the full extent in any othe personality or God. No one can be as much beautiful or attractive as like Supreme personality of Godhead Lord Śrī Rāma. The all attractive transcendental beauty of Lord Rama is just matchless. Similarly divinity & matchless-glory of his name "RAma" is incomparable to any other name of God. Śrī Rāma’s name, form, Liilaa (pastimes) and abode are all Suprememly divine, higher than the highest (परात्परम्) and sat-chit-aananda-vigrah, the very manifestations of truth, conciousness and bliss! Valmiki Ramayana, which is the most authentic source to know about Śrī Rāma and his exploits, says that all attractive Śrī Rāma is none other than the most superior God, also known as Maha-Vishnu or Maha-Surya or Maha-Shakti. Lord Rāma is the only personality who desrves to be famous in whole universe. Only he has been glorified as hero or say Purusa in all Vedic scriptures. Śrī Rāma is the ultimate refuge for all Jiva-s (souls), only he should be worshiped by all in universe. This is the clear declaration of Shabd-Prmana from self-sufficient authority Shri Valmiki-Ramayana. He is like a sheltering tree to the virtuous, he is the ultimate (supreme) refuge for the destitutes and a protector of the distressed. He is the only personality who deserves to be famous. Lord Rama is known by various names like Raghava, Koshlendra, Ramachandra, Ramabhadra etc but his eternal and the most superior , the most divine name is 'Ram' (राम). Ram (Rāma) is celebrated as the ideal hero in Rāmāyana, the first epic poem of world. No one can find any such hero in any other history of world. Only followers of Vedic-Dharma can proudly claim that they have maryada-Purushottam Shri Rāma who has no match in whole world. 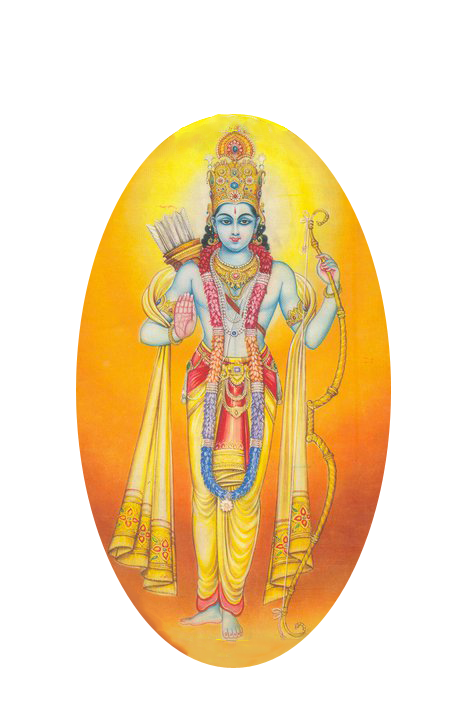 In Valmiki Ramayana and Vedic-scriptures, Shri Ram is not just celebrated as ideal hero but also as the original personality of godhead who himself descended as prince charming of Ayodhya to show the world how to lead a righteous life, to establish the highest form of Dharma, to liberate the earth from evil demons and to impart the supreme bliss to his devotees. 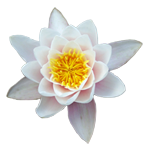 Learned transcendentalists who know the Absolute Truth call this nondual substance Brahman, Paramātmā or Bhagavān. If there is god (Bhagavān), then that is Rama, alone. How? Vishnu Puran says: - "He Who possesses the six attributes of aiSvaryam or Lordship, vIrya (Valour), Yasha (fame), Śrī (riches) , j~nAna (knowledge) and vairAgya in full (infinite) degree is called bhagavAn". 1) Shri Rama liberated Ahalya just by the touch of his feet, this showed the nature of being supreme one. 3) Rama killed the mighty demon king Ravana who was not even killed by Vishnu's Sudarshan Chakra. Thus after killing Ravana, Rama restored the glory of Vishnu again in universe. Thats why Ramayana says, Rama is Vishnorardham arthat "Vishnu ko Bhi Riddhimaan Karne Vala" which means Rama is the only personality who restores the glory of Vishnu or gives glory to even Vishnu. 4) Rama is the only personality in history who gave Liberation (Mukti) to whole Ayodhya and brought all citizens of Ayodhya in Santanik-Loka which is near to the supreme abode of Para-Brahman i.e. Saket Loka. This is the supreme lordship of Lord Rama. Hail to glorious lordship of Rama!!! whether one is a demigod or a demon, a man or a creature other than man, such as a beast or bird, all should worship Lord Rāma, the Supreme Personality of Godhead, who has a form of human being. There is no need of great austerities or penances to worship the Lord Rāma, He becomes easily sastisfied even from a small service done to him (such a compassionate lord he is. Thus He is satisfied, and as soon as He is satisfied, the devotee is successful.). [Indeed, No one can match his compassion towards his devotees, that] Lord Śrī Rāma brought all the citizens of Ayodhyā back to his divine abode Saket Loka, back to Godhead. Such a great Lord Rama is who accepted everyone be it god, demon, human, beast, bird or anyone and brought all back to supreme abode !!! So if one wants to go back to godhead then worship lord Rama as instructed by Bhagvata-Maha-Puran, with all love. 5) As Hanumana described about the supreme opulence of Rama to Ravana that just don't take Rama mere a human, he is very much capable of annihilating all the worlds again and again and very much capable to create them over again in exactly the same way. Can we find such a highly glorious praise for any other personality apart from the supreme personality of godhead? Annihilating all the worlds including the elements, their created beings, as well as the entire mobile and immobile creation, the highly illustrious Shri Rama is capable of creating them over again in exactly the same way. 1) Param-Viryam Guna is predominantly visible in hero of Ramayana. Shri Rama is the only personality in history (Ramayana and Mahabharata) and even in mythological scriptures, both, who never shown his back in war. See any personality, even incarnations of Rama has shown their backs be it any reason, Vishnu, Lord Krsna (named Rannchhod when he shown his back), Lord Shiva etc all deities have shown their backs in war. Thus Purusa or Paurushatva (Param-vIrya) culminates only in Raghunatha and it is predominantly visible in Lord Rama alone. 2) Shri Rama killed single-handedly 14000 dreaded demons in Dandakaranya in no time. 3) One time in Rama-Ravana Yuddha, when the specially fierce army of Ravana attacked Rama's army of monkeys, the fearful monkeys seek refuge to Rama, then Shri Rama single-handedly killed around 2.5 lacs demons in just hours. That time Rama was so swift in killing those demons, that at a time, thousands of Shri Rama were seen by those demons in the battle field. Such is the supreme valour of Purusa, Swayam Bhagavān Rama!!! 1) Shri Rama has been symbol of all auspious qualities a perfect man should have. He is famous for being ideal-son, ideal-disciple, ideal-husband, ideal-brother, ideal-friend, and more than all these, an ideal-king a nation can have. So only Rama is Puroshottama ( पुरुषोत्तम , the best among men) in reality, without a bit of exaggeration. Thus only Rama can be the ideal hero for whole humanity. 2) Sri Rama's Yasha (fame) was so widely spread that even among his enemies, he was celebrated as a righteous ideal man. Even his enemies were praising his righteousness (Dharma), vIrya (supreme valour) and Param-Madhurya-Guna (ultimate sweetness, charm). Even enemies were enchanted by his natural beauty. That's why in Valmiki Ramayana, it is said that Shri Rama is only personality in whole world who deserves to be famous. 3) When Rama ruled this earth, whole earth became the Rama's world. No one was interested in anything other than Rama and his glorious exploits. 5) Shri Rama has not been just famous for being the supreme god of followers of Vedic-Dharma, but more popular for his pure spotless character. Padma-Purana says: ' चरितं रघुनाथस्य शतकोटि प्रविस्तरम | '(Charitam Raghunathasya Shatkoti Pravistaram - Padma Purana, Patal Khand) means 'the spotless fame of Lord Rama's exploits has been sung in 100 crore (1 billion) Ramayana-s'. Though due to evil effect of Kaliyuga, only few Ramayana-s are available for human beings in this age of Kali, however, even the number of those available Ramayana-s exceed the number of scriptures which may be credited to all other deities. Is there any such personality or deity whose fame is so much widely celebrated and sung as like that of Lord Rama? Certainly no! Lord Rama is like a sheltering tree to the virtuous, an ultimate (supreme) refuge for the destitutes and a protector of the distressed. He is the only personality who deserves to be famous. 7) Definitely there is no one who doesn't feel thrilled after listening the glorious pastimes of Lord Ram. Shri Ram has been the legend of this universe, and undeclared Rastra-Purusa (national hero) in heart of all. 1)Lord Śrī Rāma is possessor of all wealth (all attractive beauty, Youngness, pure character, Dharma, riches, etc ) in full degree. He is the perfection of all pure auspicious qualities one may have. - All attractive beauty: Shri Rama has all attractive beauty which attracts even men, then what to say about general woman-folk. Leave aside common men-women, Rama is even attraction of all attractive Lord Krishna who attracts whole world. Just behold for one second the eternally young handsome prince Rama in his princely attire, one may forget very own self. - He is eternally young handsome prince, even demoness have been seen falling in love with all handsome prince, isn't it? - His character is spotless and that cany purify all kind of griveous sins a person can do. 2) Śrī Rāma is the consort of Śrī (Bhagvati Sita). So when Śrī Rāma was ruling this world, whole world transformed into Rama's world. All talks were centered around Śrī Rāma alone. While Rama was ruling, the people were engaged in virtue and lived without telling lies, without having greed, and thus totally satisfied in Rama's rule. Obviously when supreme personality himself ruled this earth, ] earth was fully satisfied. That's why all give example of Rama-Rajya (rule of Rama on this earth). 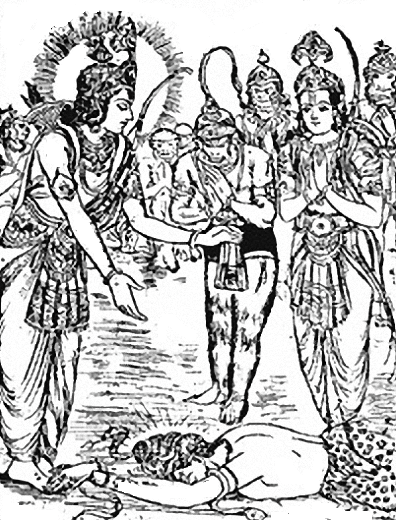 3) As per Valmiki-Ramayana, when Aadi-Purusa Śrī Rāma himself incarnated as prince of Ayodhya. All prime forms (भाग forms) of Vishnu incarnated as younger brothers of Lord Rama to do service of their supeior, the original personality of godhead (Śrī Rāma). This shows that Aadi-Purusa (the primeval god) is the most superior and served by his expansions. From various scriptures, it can be established that Rama's brothers : Lakshamana, Bharata and Shatrughna are none but Sesha (Sankarshana), Pradyumana, and Aniruddha (the Vyuha form of Vishnu, expansion of Vasudeva who is Rama). One may think that only Krishna is told to be Vasudeva. However, Shri Rama is also told as Vasudeva in Shri-Mad Bhagvatam Mahapurana as well as in other scriptures. Vasudeva means Maha-Vishnu as well as the primeval lord who pervades everything. In Shri Krshna-avtaar of Lord Rama, Sankarshana became the elder brother of Krishna. So only Rama-avtar shows that Rama is the onriginal personality of godhead being served by all prime forms of Vishnu. 4) Rama is not only the lord of lord Shiva, but he is the even the lord of Lord Vishnu too, that's why Shri-mad Valmiki Ramayana declares Rama being Prabhoh Prabhu (Lord of even Vishnu). The prime form of Lord Sada-Shiva is Hanuman Ji who is the best friend as well as the best servant of Lord Rama. Thus being the supreme master of all deities, Rama has complete Śrīyah. No deity or god except Lord Rama has servant like Hanuman ji and devotee like Lord Shiva. In Padma-Puran, Lord Shiva himself accepts Lord Śrī Rāma to be his only Ishta-Deva and completely surrendered in his lotus feet. Isn't Rama who has devotee like Lord Shiva and servant Like lord Hanuman, the possessor of supreme wealth? lotus feet of Śrī Rāma! 1) Rama has been proclaimed as Vigrahvan Dharmah means who is the embodiment of Dharma. It means Rama was the knower of the subtle form of J~nAna, How could he use his Dharma, no one can understand apart from him, thats why he is the supreme J~nAna-Guna-Dharma Swarupa. 2) Rama had already given his words to Vibhishana and Sugreeva and even before killing Ravana or Bali, he declared them king of Lanka and Kishkindha respectively. This shows Rama had supreme control over time. The supreme personality of godhead has nature of being completely unattached towards any material desire. So Param-Vairagya Guna has been clearly seen or predominantly visible in Lord Rama alone among all his incarnations. 1) There are many instances where Rama showed his Param-Vairagya Guna like happily leaving the kingdom of Ayodhya just for keeping promise of his father towards his step mother. He left the greatest and richest kingdom on earth of that time, leaving all his luxury and comforts in just hours without any regret like a mere old cloth . Can anyone imagine that very next morning Rama is going to be coronated as the prince (heir) of Ayodhya and even all citizens, courtiers, ministers, brothers are in favour of Rama and want to see him coronated as soon as possible but when Rama heard the wish of his step mother and the promises made earlier by his father, Rama decided without any regret to leave ayodhya to keep the promises of his father towards his step-mother. Rama sarificed all his comforts as well as throne for younger brother Bharata and decided to spend 14 years of hard life in forests as per the wish of his step mother. Definitely he could live with all luxury and comfort in Ayodhya as he was not responsible for the promises made to his step mother yet he chose to keep the promise of his father towards his step-mother. Such was the greatness of Shri Ram!!! 2) Shri Rama happily gifted the golden-Kingdom-Lanka to Vibhishana like a mere golden-ring and kingdom of Kishkindha to Sugreeva. 3) In whole 14 years of exile, Rama never entered in any city and always lived a life of an ascetic. So who can show such Param-Vairagya-Guna in any other personality apart from Rama??? Thus we see all 6 qualities are full and complete in Lord Rama alone, He accepts everyone be it Human, demon, animal, bird or any living being. If Rama is not Bhagavān , then no one qualifies to be called as Bhagavān as per Sanatan-Vedic Dharma principles. 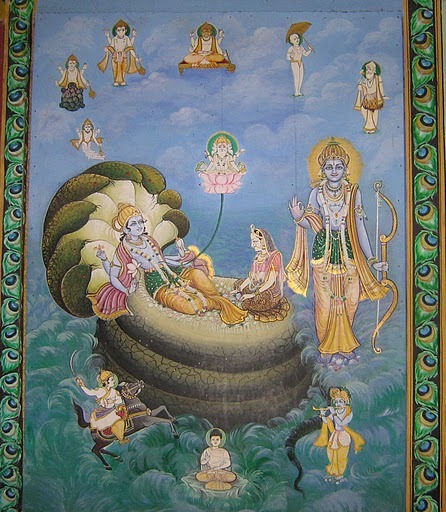 Apart from all above attributes which can be found to full degree in Bhagavān (God) alone, there is an another attribute (virtue) of Rama which makes him very unique among his all incarnations. That attribute is his pure character which makes him "Maryada Purushottam". Apart from Rama, no one can hold the title of being "Maryada Purushottama". Shri Rama is famous for one word (keeping his promoises at any cost), one arrow (Rama-Baan, the infalliable weapon of Rama which can eliminate anyone) and one wife (ek-patni Vrata i.e. devoted towards one wife only). Rama was the king of the greatest empire of that era and that time it was a custom among kings to keep many wives in their palace. Even Rama could have married many princess, but Rama was solely devoted to his consort Sita alone. Such pure character of being Ek-Patni-Vrata (devoted to one wife even in dreams) can't be found in any other personality of any other incarnation of Shri Rama as only Shri Rama has established the highest form of Dharma. In other words, one can say "Whatever Rama did, it became the highest form of Dharma". Shri Rama never ever spoke any lie. He never cheated any man or woman. If someone has no character then how can one claim that he is protector of Dharma? Whatever Shri Rama promised to someone, he delivered it. Shri Rama never ever thought of any second thing if someone is weak (Sugriva) or a demon (Vibhishana) before giving protection to a person when someone asked his refuge be it man, woman, god, demon, animal or any living being. Only supreme being can give full protection from all types of fears. Such combination of all pure qualities and pure character can be found only in Shri Rama, and thus only he is eligible to be called as Bhagavān, the original personality of godhead. Lord Rama is original source of all Avtaara-s (incarnations of Lord Hari) and He is himself Supreme Personality, known as Purusa in Veda-s who is always situated in original ultimate form of Śrī Rāma-Rupa in the divine spiritual planet Saketa (Ayodhya) which is full of Supreme bliss of Brahman i.e. BrahmAnanda. Out of infinite incarnations or major 10 incarnations, there are 3 Poorna-avtaar-s (पूर्णावतार ) or Purna-Brahman. Out of aforementioned 3 PoornAvtAra-s (पूर्णावतार ), both Shri Rama and Shri Krishna are glorified as Sarva-Karan-Karanam (means the cause of all cause) and Swayam-Bhagavān (God himself) in Vedic-scriptures. Thus these two are more perfect than NrisimhAvtara (Half man-lion incarnation). So both, Shri Rama and Shri Krishna are known as Purtamam-Brahman (पूर्णतमम् ब्रह्म ), superior than Purn-Brahman (पूर्ण-ब्रह्म ). Out of above two Purtamam-Brahman, in all vedic- scriptures only one personality i.e. Shri Rama alone is glorified as Hero (means the real original Purusa) who has never shown his back to his enemies as Shri Rama has complete Valour to infinite degree. Complete Valour to infinite degree is one of the six qualities on basis of which we know who is Bhagavān. Thats why Valmiki-Ramayana declares Rama to be Ishta-Deva of all worlds (iShta sarvasya Lokasya Ramah, इष्ट: सर्वस्य लोकस्य रामः ). There is also another kind of speciality with Lord Rama alone that his name "Rama" is said to be Para-Brahman itself in Vedic scriptures. This kind of speciality is never found to be associated with any other personality. Shri Krishna is called to be Krishna because he is all attractive supreme personality, who attracts everyone. But Shri Rama is the personality who not only attracts everyone by his natural beauty but he is so much exceedingly attractive that even Krishna is found to be attracted towards Lord Rama. Shri Krishna himself accepts this fact in BrahmAnda-PurAna. Our Vedic scriptures say "there is no one even equal to Rama so what to talk of anyone being superior to him." Param-Bhāgavat Shri Hanumān says "I worship all times Lord Śrī Rāma, who is eternal and who is very form of Sat 'Existence', Cit 'Consciousness' and Ananda 'Bliss'. Śrī Rāma is an expert in the rāsa leelā, the dance practiced by cowherds, Krishna and gopis. His parts are Brahman (Brahm), Viṣṇu (VishNu) and Mahesa who are the sustainers of the world. He is Śrī Rāma who transformed himself as Vishnu in starting of the creation. Lord Śrī Rāma, the original source of all the other incarnations, transformed himself in his four-armed form of Vishnu!! Lord Shiva tells Pārvati: All incarnations of Lord Hari are originated from Śrī Rām Naam. Lord Śrī Rāma, the best among the Raghus, is the original personality of Godhead, among all the incarnations; and the moonlight coming from the nails of Śrī Rāma's feet is praised as Parabrahman by the scriptures. Now as Lord Rama is the original godhead among all incarnations, Śrī Rāma's Paratva (परत्व Supremacy over other forms of Brahman) is also more evident from the words of scriptures that Lord Rama has two arms in his eternal form residing in his supreme abode Saket-Loka and supreme Purusa of Veda-s is described as two armed Para-Brahman (i.e. 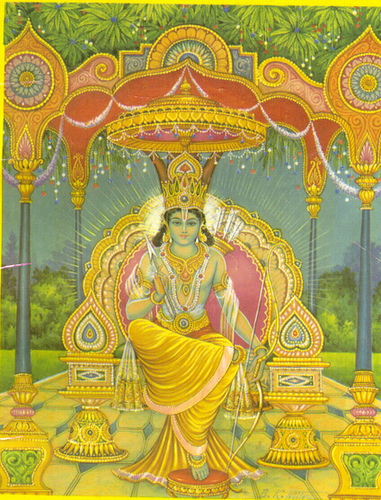 Lord Śrī Rāma). The Maha-Siva went to the abode of Śrī Rāma i.e. Saket loka, which is beyond the reach of sensual organs. Reaching there the great Siva found Raghava (Lord Rama) the supreme soul possessed of eternal body. Śrī Rāma who is the lord of all kinds of power, was seated along with me ( Sita ). This entire universe is activated by the prowess of eternal Raghava (Lord Rama), with two arms. Same Lord Śrī Rāma transformed himself into various forms and also into 4 armed Vishnu for sustenance of the universe. There is none in whole universe who is beyond Lord Śrī Rāma. Lord Śrī Rāma is higher than even the highest which means Śrī Rāma is the only person (Purusa) who is superior than himself. So lord Śrī Rāma comes himself in Treta-Yuga in his original Swayam-Rupa i.e. ultimate form of Para-Brahman, while in various incarnations he assumes different forms like of Matsya (divine fish), Varaha (divine boar), Narsimha (half man-half lion), Krishna etc. Of the various avatar, Sri RAmavatara is unique and highly glorious. While the earlier avatars only served a limited purpose, namely subduing the wicked and protecting the good, the main purpose of Ramavatara is Dharma -Samsthapana. Its uniqueness lies in the fact that the Lord chose the role of a man - an ideal human. The glory of the Ramavatar is the demonstration that the dharmic way of life could be lived by all in thought, word and deed, under all conditions and circumstances. This has been achieved by Lord Rama in this descent by becoming the son of King Dasaratha. तस्माद्रामायणं देवि! वेद एव न संशयः ।।"
tasmādrāmāyaṇaṃ dēvi! vēda ēva na saṃśayaḥ ।।"
Supreme being is known through only Vedas. When that Supreme being born as son of Dasratha (Śrī Rāma) in Ayodhya, that time all Vedas manifested themselves through the mouth of sage Valmiki, the son of sage Prachetus, directly as the Ramayana. Therefore O' Devi, there is no doubt that Ramayana is Vedas itself. "When the Supreme Lord who is sought after and proclaimed by the Vedas was born as the son of Dasaratha, the Vedas became the Ramayana. The Ramayana is Vedas in action". Lord Śrī Rāma is himself the original Source of All Avtaara-s..
Those all Avtara-s of Lord Śrī Rāma make salutations to him in Saket Loka. Lord Śrī Rāma of Ayodhya is the God of all the Gods ( देवदेवेश ). Lord Krishna and other incarnations are just Amsha-Avatara-s (अंशावताराः कृष्ण:the plenary portions) of Lord Śrī Rāma, those all innumerable (ह्यसंख्यका) incarnations (Krishna, Varaha etc or thousand of Krishna-s too as said by other scriptures) always do salutations (प्रणमन्ति) in Lotus feet of Lord Ram. I don't Know any other Supreme being, the God of all the Gods other than that Lord Ram. All the innumerable incarnations are originated from Lord Ram alone. Then Garuda asks:- Are all Amsha-Avatara-s like Bala-Rama and Krishna etc eternal? Again Brihad.Brahm-Samhita says same thing that many incarnations of Shri-Hari make salutations to Supreme Purusa of Veda-s i.e. Lord Rama. "RAghava (Śrī Rāma) shines with SitA on the divine throne in world of SAketa (AyodhyA) where BrahmA, Shiva and Vishnu constantly worship him. He (Lord Rāma) is surrounded by many divine fish incarnations, monkeys and also by plentitude of the Narasimhas or Narasimha incarnations, tortoise incarnations, and sons of Sri Nanda, i.e Sri Krishna, Haya, Gala, and Hari. They all are eager to receive the orders of Lord Rama. Keshava, Vamana the foremost persons, Narayana, Yudhisthira, Shri Krishna, Haladhrik BalaRAma and VAsudeva, the enemy of the demon Madhu as well as various kinds of Mahendras and millions of Goddess Durgas, eager for advice, remain always in front of Sri RAma (Śrī Rāma) near His feet" . Here, the epithet Nanda-nandana signifies that form of Lord Krishna, who delights Nanda and dwells in MathurA, while Sri Krisna refers to the one who resides in DwArika. 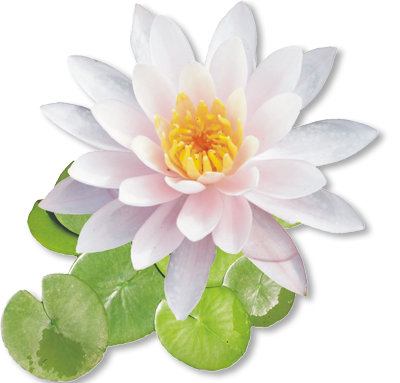 The content on website is written purely for the spiritual purpose of spreading love and devotion in the lotus feet of Bhagavan Sri Sri SitaRam by SiyaRaghavendra Sharan. Website is developed and maintained by SiyaRaghavendra Sharan. All Rights Reserved.